If you receive the error message below when trying to sign in to Google, please click on the 3 dots beside your name and select Sign out and Forget. Close your browser and relaunch it and try to sign back into Google. This applies to staff and students. corner. A good value is an address that ends with @henderson.kyschools.us. new mail at that point. If you have any trouble accessing webmail after the migration, please clear your browser cache and try again. How to clear cache in Google Chrome. How to clear cache in Mozilla Firefox. How to clear cache in Internet Explorer. Mobile clients must be reconfigured as part of the migration. Instructions for different phone platforms are found below. Keep in mind that if you have configured your account in the devices native app as well as the Outlook app, both will need to be reconfigured. Some of the Microsoft apps may use a shared token. If you have issues where you're seeing your mobile apps continue to point to the megatenant even after logging out and logging back in, make sure to sign out of all of your Microsoft apps on your phone. Once you've signed out, reboot your phone. 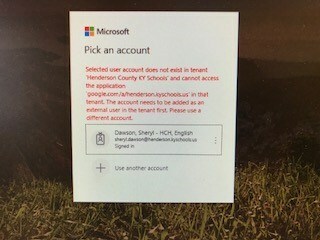 After rebooting, sign into your apps and confirm that you are connected to the new tenant with your @district.kyschools.us address and can see the new tenant. How to setup your Outlook 2016 email profile on your computer. To manually reconfigure your Outlook profile, you must complete the following steps. Directions with picture are located HERE. Left click on the little window in the bottom left hand corner of your computer. Start typing Control Panel to navigate to the Control Panel. Select Categories in the top right and switch it to Large Icons. Click Mail. Sometimes this shows as Mail (Microsoft Outlook 2016) or Mail (32-bit) or something similar. Click Show Profiles. Click your Outlook profile. Click Remove. Then launch the Outlook application from your desktop or start menu. Navigate through the wizard by clicking Next. You should see your account auto-populate based off of the machine credentials you’re logged into. You may be prompted for a password during this process. To make sure your Outlook client is working properly, make sure that the status in the bottom right shows Connected to Microsoft Exchange and you’re receiving new mail.